Peel off a few strips of cucumber skin using a channel knife, creating a striped pattern. Cut cucumbers in half crosswise. Cut each half into quarters before cutting into 1/4- to 1/2-inch slices. Place into a colander; toss with some kosher salt and let sit for 10 to 15 minutes. Meanwhile, cut cherry tomatoes in half. Rinse cucumbers; drain thoroughly for 10 to 15 minutes more. While cucumbers are draining, slice onion thinly. Cut bell pepper into strips. Turn knife diagonally and cut strips into diamond-shaped pieces. Slice Kalamata and green olives. 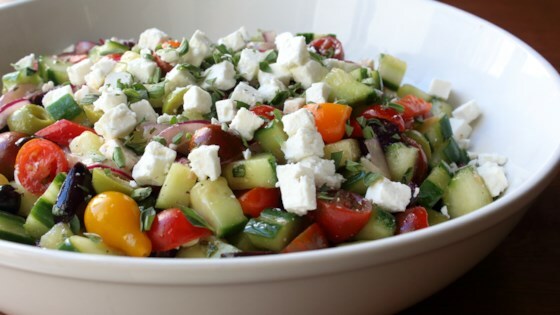 Combine cucumbers, tomatoes, onion, bell pepper, olives, and 2 tablespoons oregano in a bowl. Season with salt, black pepper, and cayenne. Sprinkle in vinegar and toss thoroughly. Drizzle in olive oil. Add about 2/3 of the feta cheese and toss again. Cover with plastic wrap and refrigerate for 30 to 60 minutes. Give the salad another mix. Taste and season as desired. Scatter remaining feta cheese on top and garnish with remaining oregano.